Athletic Mouth Guards, online at athleticmouthguards.com, offers custom athletic mouth guards made in the comfort of your home that will defend your teeth against sports injuries. Custom-fitted athletic mouthguards are made by a dentist or a professional laboratory. They are individually custom designed to provide the best protection, fit, and comfort. The custom mouthguard fits over the teeth producing less interference with breathing and speech than cheaply made boil-and-bite mouthguards. 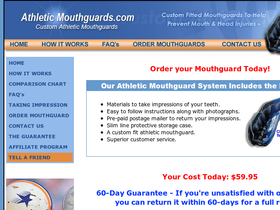 Before ordering your custom mouth guard, visit 58coupons for the best promotions, savings and coupon codes from AthleticMouthGuards.com. Buy an Athletic Mouth Guard today and save $15 on orders over $100 with this promo code. Follow this link. Enjoy $10 savings on Athletic Mouth Guards orders over $100 when you use this code at checkout. Click link to begin. Get custom fit athletic mouthguards for the entire team and get great group discounts. Click link to get started. Visit Athletic Mouth Guards today and get yours for only $59.95. Follow this link.